Although my taste generally runs more towards epic fantasy door-stoppers, with massive world-building and bloated casts of characters, Moth and Spark was an enjoyable diversion. I could have done with less romance and more dragons, and would have preferred to see the middle act shortened in favor of expanding the final act, but that's simply a matter of personal preference, and not a criticism of the book - which delivers on exactly what it promises. Anne Leonard's writing style fluctuates a bit here, with the opening chapters actually coming across as stronger and more polished than the heart of the novel, but overall the entire book is solid. Corin is nicely established in the opening chapters as a capable leader, a young man with a good heart, who happens to be laboring under a compulsion. Tam is similarly established as a strong young woman, not just smart but clever, who aspires to rise above her caste. Both characters are a bit too perfect, a bit too pure, but while that might otherwise be a flaw, their romance works precisely because of it. As for that romance, I thought it was very well played out, even if it was rushed. Their dialogue was natural - amusing at times, tender at others - and their relationship progressed very well. The fact that they complement each other so well, with Tam's newly revealed visions conveniently serving Corin's role in fulfilling the prophecy, was not surprising. What was surprising was the fact that, while the connection provided them with purpose, it was not relied on as the primary connection between them. I've seen that done before (I'm looking at you, Terry Goodkind), especially in stories where insta-love is necessary to the plot, and it always feels artificial. The court intrigue and military drama surrounding them, however, wasn't nearly as strong or as detailed. There were glimpses here and there of a solid high-fantasy core, but Leonard always seemed to pull back just as I was getting into things. To be fair, that element clearly is not the focus here, but it did have an impact on how I read the story. As for the final act, make no mistake, there is some fantastic action and adventure in the closing pages. It approaches silliness at times, and there were a few plot/tactical holes that made me groan, but it was a heck of a lot of fun. The final chapters move along at a great pace, with some genuine moments of dramatic tension, and the ultimate climax more than pays off on the promise of the opening prophecy. 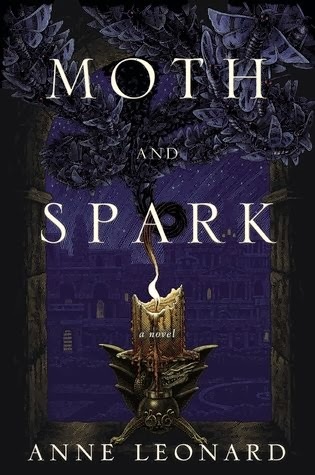 For those readers in the mood for a light, romantic fantasy, then Moth and Spark is a great pick. For those readers who come for the romance, but who walk away wanting more of the epic fantasy elements then it may just be the perfect gateway novel as well. Ah! Don't look at Goodkind, don't do it! ahem. Can't argue with anything you said. I always want more details of the military aspects too, but enjoyed this book without the better than I would have others. Pretty strong debut over all. I also tend towards epic fantasy and away from romance, but this one was handled well and fit my mood for something light and different.I agree, it wasn't perfect, but it was fun. And Goodkind, *shudder* This was definitely handled way better than that. I may have dabbled in quite a lot of Romance novels in my teen and college years, and I have to say most of the relationships in this genre are rushed...but I found the great thing about M&S is that even though they like, went from meeting each other to getting married within days, the writing was done so I didn't actually feel like it was that fast. That made their romance a lot easier for me to take in.